Should a member of the public wish to access more information relating to an application, for example because it may affect them and they may wish to comment, there is a link below to the Harborough District Council Planning website with an explanation of how to access it and what you can find there. That website will provide detailed information about the application, including site plans and any comments already submitted. To find the planning applications specific to Great Easton consult the Harborough Online Planning Applications page. Use the tab marked Simple. The Applications button will be pre-selected. Select Current from the choices in Status. Type Great Easton into the Search box. 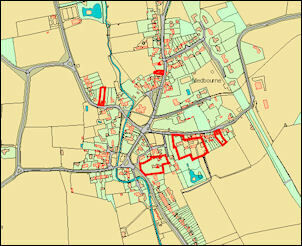 This search will return Great Easton planning applications but it will also return some from outside the village, e.g. Bringhurst and Drayton. 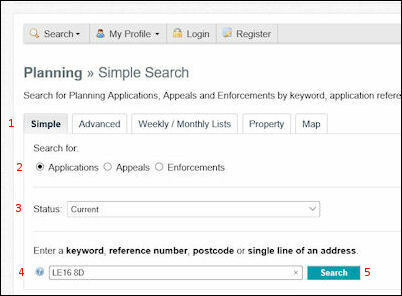 A typical search looks like the screen shot below; this shows the individual planning applications. You can also use the link Show results on a large map. This will show all the properties with planning applications outlined in red (see last screenshot). The map can be zoomed; click on any of the highlighted properties to bring up the planning documentation specific to that request. Should you wish to make a comment, the website will give instructions on how this can be done and you need to ensure you make any comments within the deadline period. Finally, should you wish to submit a planning application, the Harborough District Council website also provides information to assist you.